This happens to me pretty much every day at around 3 o’clock, providing that I’m working from home. I get up from my desk, put on the teapot, throw a bunch of things in the blender, whirl it all together, and end up with a cozy and satisfying latte-ish drink that gets me through to dinner time. I don’t drink caffeine anymore, because I’ve always been very sensitive to it, and found that avoiding it altogether really helps with even energy levels (I may have made a few exceptions in Italy :)). But this little ritual takes me back to the days when 3 o’clock meant a cup of really good tea or a matcha. There’s really nothing better. I end up making a different drink every time, based on my mood and the ingredients I have on hand, but the general formula is the same. 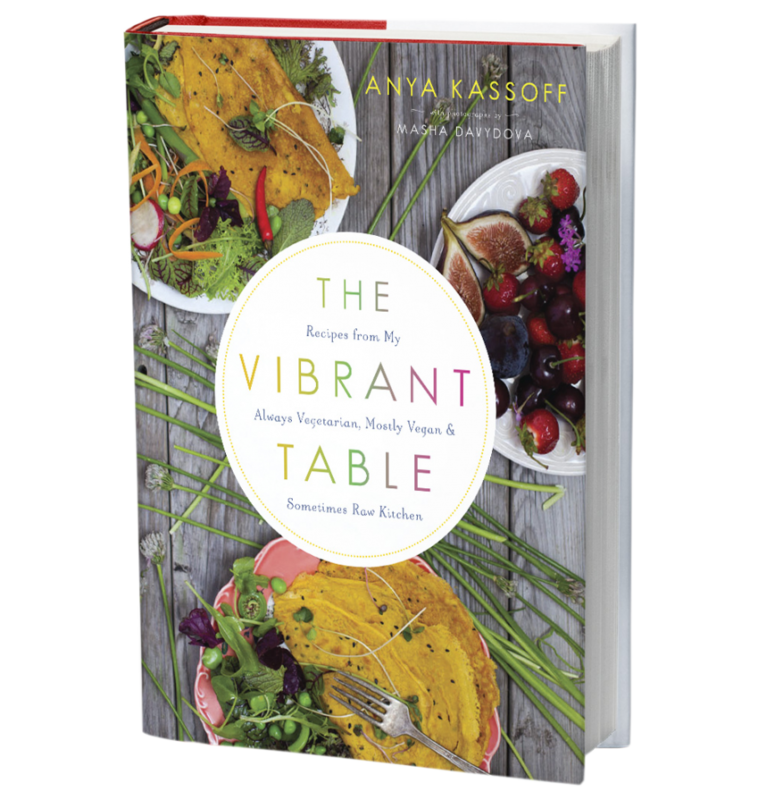 There’s always something for creaminess, something for flavor, something for an energy boost… So I thought I’d give a ‘no-recipe’ recipe here, as well as a few of my favorite combinations. Midday super-latte making is a really fun routine to add to your day if you’re around a blender, and it’s good for your in a number of ways: it gets you out of the busyness of the day and nudges you to take a break, it’s creative, and the beverage you’ll end up with will likely be good-for-you, warming and tasty. 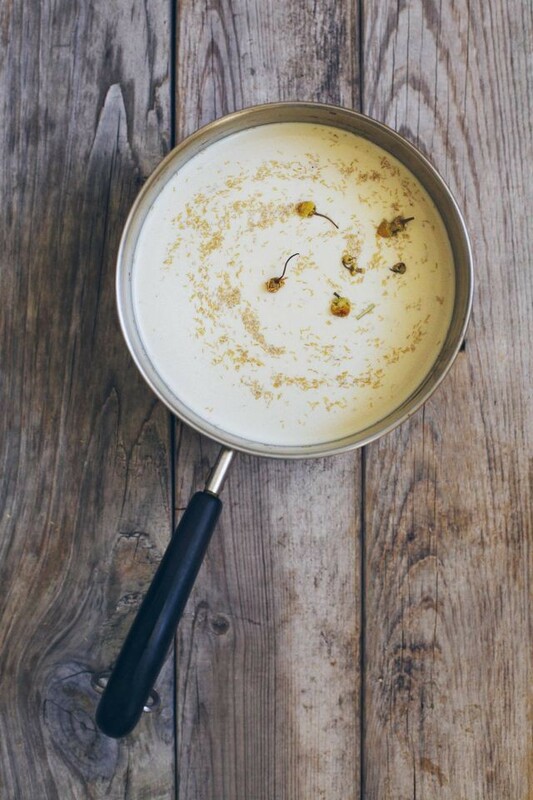 This was one of our most popular recipes last winter. It’s an incredibly satisfying blender hot chocolate that comes together in seconds. Another hot chocolate, but this one is a white hot chocolate infused with rosemary. A great case for using cacao butter in drinks, which lends both its chocolatey flavor, as well as a richness and a froth. Another blender latte, but this time boosted with all the green benefits of spirulina, without the swampy taste. The most grounding and delicious latte to drink before bed. 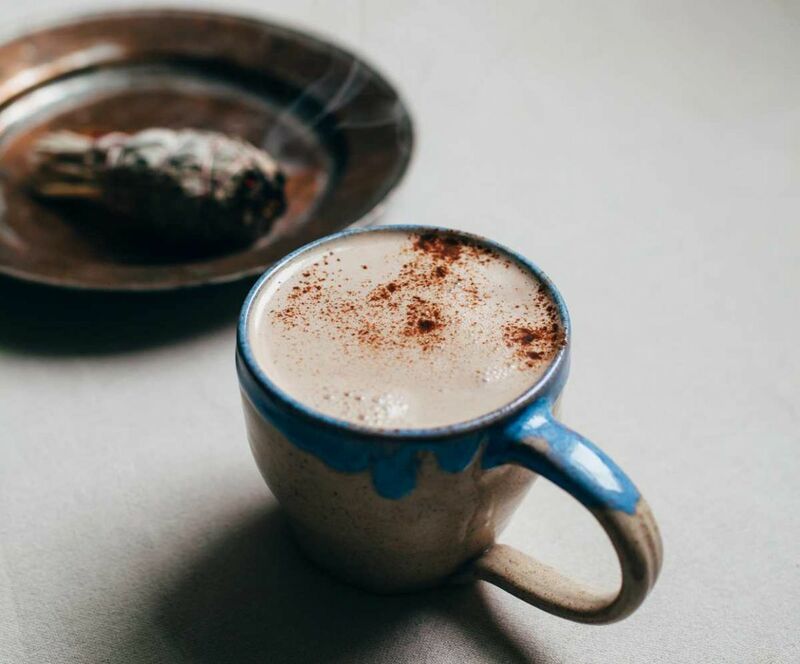 Playing off New Orleans-style coffee, this herbal mocha is a great option for those trying to take a break from coffee and missing it dearly. 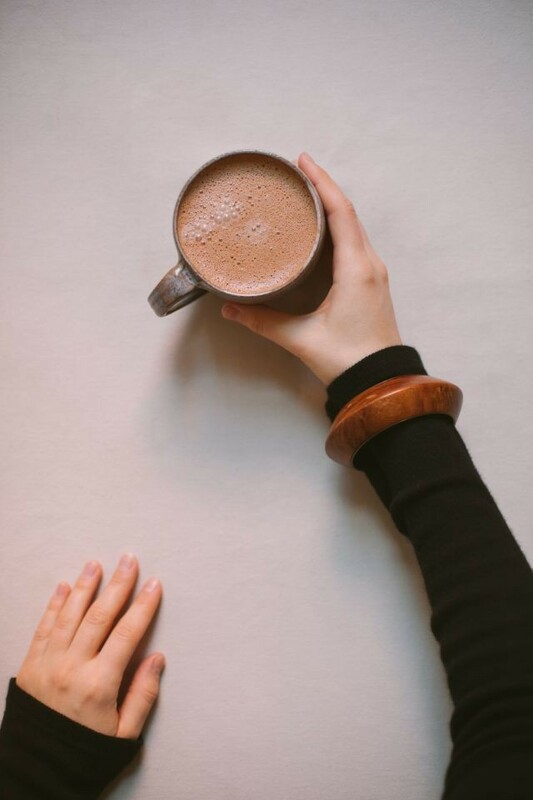 Chicory brings a coffee-like richness, while maca and cacao boost energy. 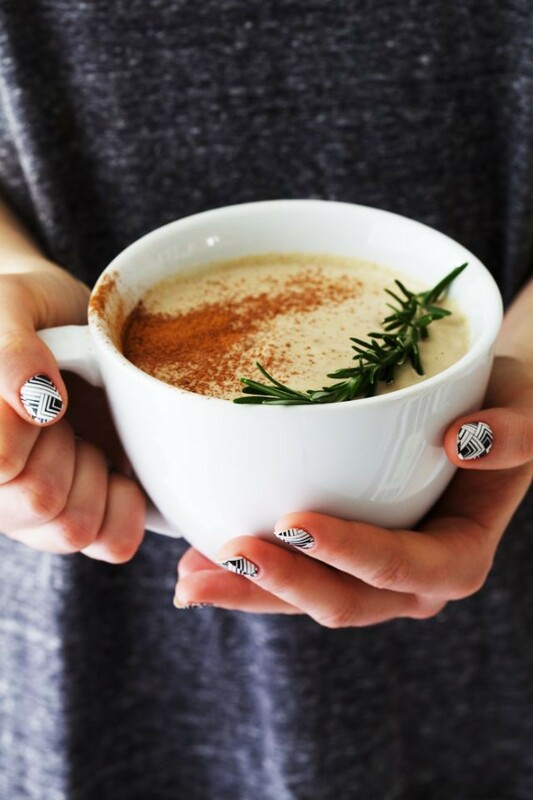 This is basically a golden milk latte, but boosted with the flavor and health benefits of miso and raw honey (not vegan). I like to drink this one before plane journeys, since miso might be helpful when it comes to countering the radiation we are exposed to on any given flight. This is your base liquid, which will determine what other ingredients you will add to your blender. Choose one or a couple. 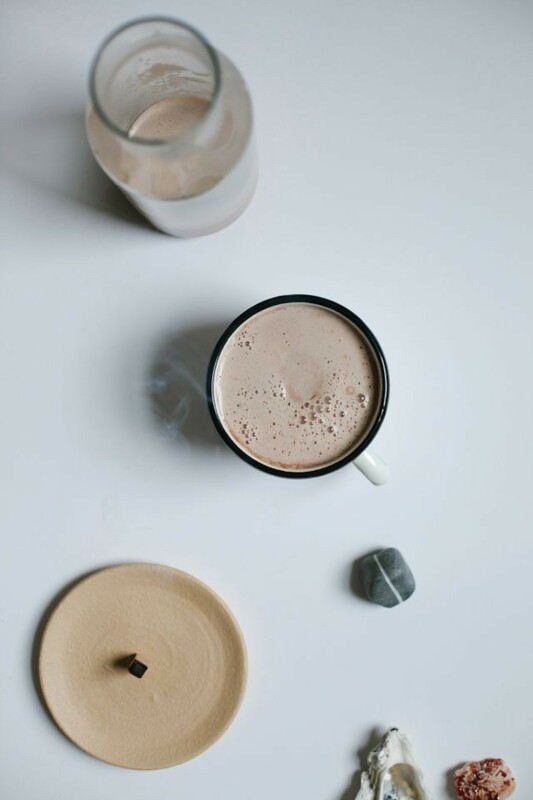 Hot water is a blank canvas, while herbal coffee and tea will give you a base flavor, which you can play off off with your other ingredients. tea – herbal, black, green, etc. hot plant milk – coconut, almond, cashew, oat, etc. Add one of these ingredients or a combination of a few of them for a rich, extra-creamy latte, especially important to include if you are just using hot water as the base. This is optional if you already have a creamy element, but adding some extra fat to your latte contributes to the most beautiful froth. 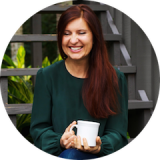 Also, if your base is something with caffeine like a black or green tea, this will help slow the absorption of caffeine for a more even boost of energy (like in Bulletproof coffee). Add as much sweetness as you need, tasting as you go. Play off your drink base while adding some flavor. 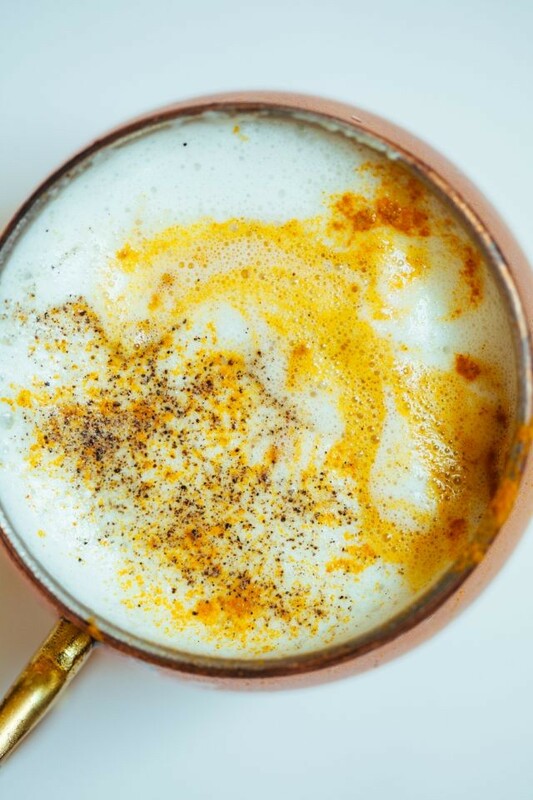 Both cacao powder and turmeric do well in creamy, milky drinks, while spices, herbs and vanilla can be used millions of ways (just see the drink round-up above). 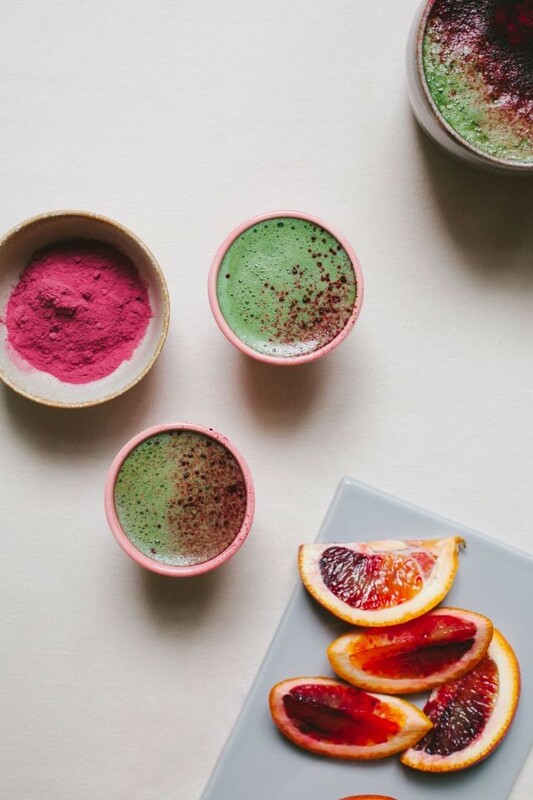 My absolute favorite energy-boosting ingredient for drinks is maca powder – it instantly wakes me up and tastes so delicious. But there are a ton of other boosters you can add to your lattes, some ideas below. more: pearl powder, tocos, mucura pruriens, spirulina, etc. etc.